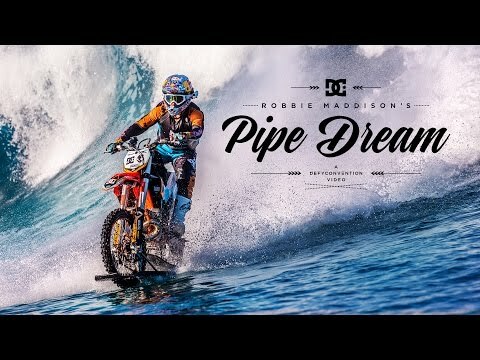 DC motocross videos presents Robbie “Maddo” Maddison’s in Pipe Dream giving the world a chance to witness history being made as Maddo rides his dirt bike on the powerful and iconic waves of Tahiti. From his helmet to motocross boots, Maddo was dressed for FMX when he took his dirt bike into the uncharted saltwater terrain of the Pacific Ocean in French Polynesia. Two years plus Robbie has been focused on making surfing on his motorbike a reality. His efforts paid off in Tahiti, where he rode the world famous waves at Teahupoo.